The 4th of July is a major holiday in the United States. It’s officially called Independence Day and is a celebration about our freedom as a nation. The Fourth ties in themes of patriotism, loyalty, thankfulness, and the belief that freedom is a gift from God. Jesus Gives Freedom from Sin (John 8:32) This lesson plan shows how obedience and faith in Christ can overcome the power of sinful habits in our lives. No-hassle lesson format makes this one easy to teach with very little preparation or supplies. Ideal for Sunday School or Children’s Church. “Get Free” Object Lesson from (Acts 16) – Using a house key for the object talk, Mimi teaches how God saved Paul & Silas from jail. Then their witness to Christ helped the jailer get free from sin and follow Jesus also. Freedom in Christ Children’s Sermon (John 8) This shorter lesson has a strong evangelistic emphasis. You could combine it with other resources listed below to build a custom lesson plan for the 4th of July. Christian Flag Object Lesson (Galatians 5:1) will illustrate how we can have freedom through the Gospel. Fourth of July Craft Ideas. We’ve posted a “Pray for Your Leaders” coloring pages helps enforce the main Christian duty under any government is to seek God’s blessing for their fellow citizens. We also created a new “God Bless America” coloring sheet. This one featured a diverse group of children’s faces and images of both city & town. We expect to post some new 4th of July coloring pages each summer. Devotional Christian has posted a list of Bible verses about freedom. Use these to add a scriptural message to any of the crafts above. Use the Wordless Book to teach kids about freedom from sin through Jesus Christ. You could modify our lesson on Thankfulness to highlight the blessings of living in a strong, secure, and free nation like America. We also have a lesson on the Passover that deals with themes of national freedom. I know those are long shots, but someone might find them useful. One danger of doing patriotic crafts in church is losing focus on God. Be sure to explain that our country is a gift from God. Not all believers live in a secure and free nation like America. At the same time, America is a nation for all people even those who do not know Jesus. Offer prayers to God giving thanks and also pray for other nations who do not enjoy freedom. Don’t let the kids mistake patriotism for piety. I asked readers to give me their best 4th of July Ideas and here is how they responded. Sherry Maycock: If its about independence and freedom you could relate it to how we have our freedom from sin and eternal life because of Jesus death on the cross.Does that help at all?Regards Australia.C.R.C. Lin Pearson: Tony, you are right “I never want to teach kids that patriotism = piety.” Thinking about patriotism, it can so easily descend into triumphalism, what we in the UK call jingoism ( a belligerent attitude), into empire building and a “we are the best in the world”, forgetting that every blessing our lands have is a gift from God, by his grace. I agree with Sherry that the 4th is a day to remember real freedom and the One who bought it for us at such a cost. Kerry Tastinger: You could also talk about Moses and the exodus. Sherry Maycock MAYBE YOU COULD TEACH THEM ABOUT HOW THEY WERE RESCUED BY THERE INDEPENDENCE THE SAME AS GOD Rescued us. Games teach them about rescuing by using the blow up rings you float in swimming,having one pretending to be in the water and the other throwing the ring over them to rescue.Hope that this is of some assistance.Sorry about the typing its very late here 12:12am at night.Regards Australia C.R.C. The lesson, Freedom Isn’t Free is good for those who have been born again. Yet it has no direction or invitation for the sinner to know his/her need to be born again, to die to sin, and be made alive unto eternal life through the knowledge and acceptance of Jesus’ work upon the cross. Many lessons are only geared toward telling people they are saved when they haven’t even been saved. That’s why God puts teachers like you in the classroom. Our materials are just a guide and help for your ministry. God bless. 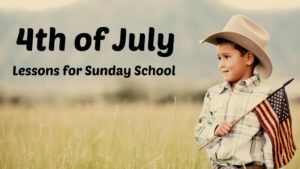 Combined Freedom in Christ sermon with Jesus gives Freedom from Sin for 4th of July lesson. Thank you for your help. I found it very useful. Tony Kummer (Editor) reviewed & updated this page on : February 11, 2019 at 11:46 am. All our content is peer reviewed by our readers, simply leave a comment on any post suggest an update.